'Sky's the Limit' Sock Yarn and Project Bag Combo!! We've done it again!! We have a NEW fantastic colorway, inspired by an amazing (and SOCK THEMED!) fabric. Again, we worked with Tanya of Maybea Crafted to find the perfect fabric (hello Socks!!!) and she expertly sewed them into her 'Small Poppins' project bag design.This bag measures 7x9x4 inches, and we can personally tell you that you can fit TWO sock projects in it. We LOVE this style bag!! Having never done this kind of thing before, we have an EXTREMELY LIMITED STOCK of Yarn and Bag Combos, the yarn by itself will be available as soon as the bag/yarn combos sell out! 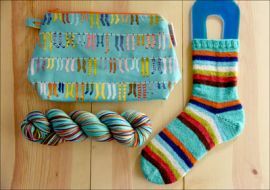 This colorway is "Sky's the Limit"
Wide stripe in Seafoam, burnt Orange, Deep Blue-Violet, Ice Blue, Cream, Chartreuse, deep Magenta, and Chocolate Brown in smaller stripes.